The vibrant Rajasthan is a storehouse of culture heritage, history and abundance of nature’s delight. Hence the princely state of Rajasthan has been our favorite tourist destination. 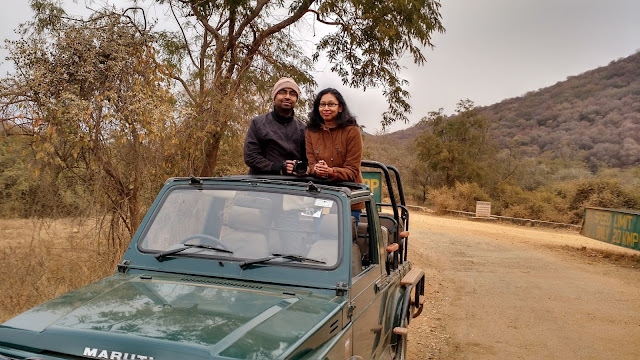 To mark our second wedding anniversary, husband and I planned a trip to Sariska, the city known for its tiger reserve. 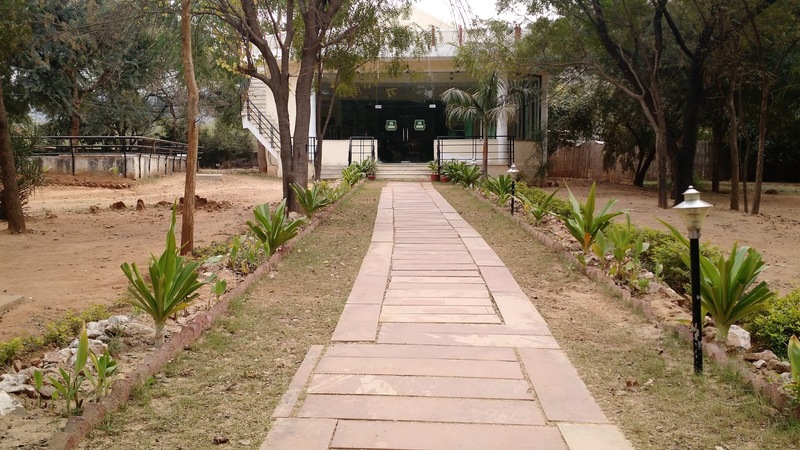 There are very few accommodation options in Sariska. Ensure making advanced booking. 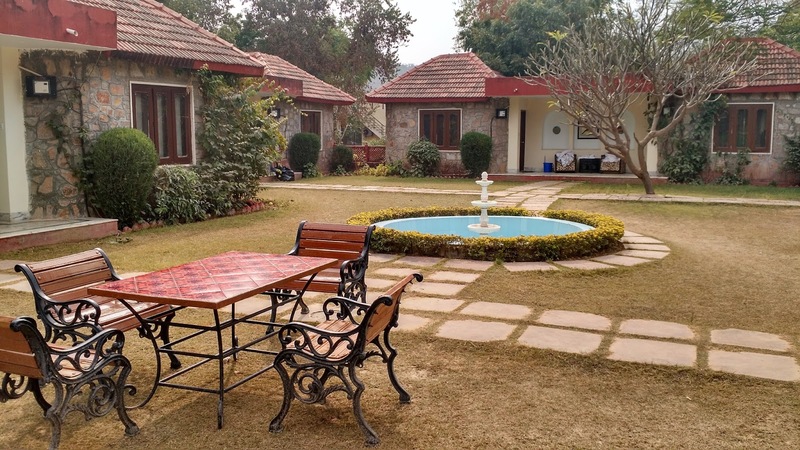 Tiger Den is a Government approved tourist hotel, which is close to the sanctuary entrance. You can consider staying there. Though it was a quick weekend getaway, we booked the most popular resort for one day stay. Usually we spend less on hotels during trips, but this time we chose luxury. After-all anniversary stay should be a special one. We booked Sariska Tiger Heaven by Sterling Holidays,the brain child of wildlife photographer Mr. Dinesh Durani, which was managed by Thar Camps initially. 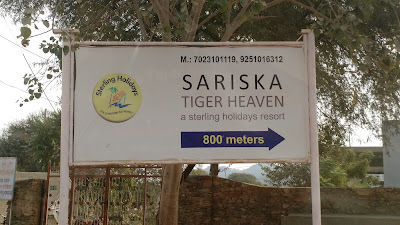 Tiger Heaven is 5 km away from the sanctuary. Read more on the new website http://bit.ly/2kh24mK. Built with the objective of staying close to mother nature, Tiger Heaven resort offers a relaxing stay to all guests amid the rich experience of wilderness. The entire facility is spread over a huge area which comprises accommodation, swimming pool, dining hall, activity area, bonfire area and huge gardens with sandy treks running in between. The reception is open 24 hours where a smiling Lalita would patiently help you with all queries. 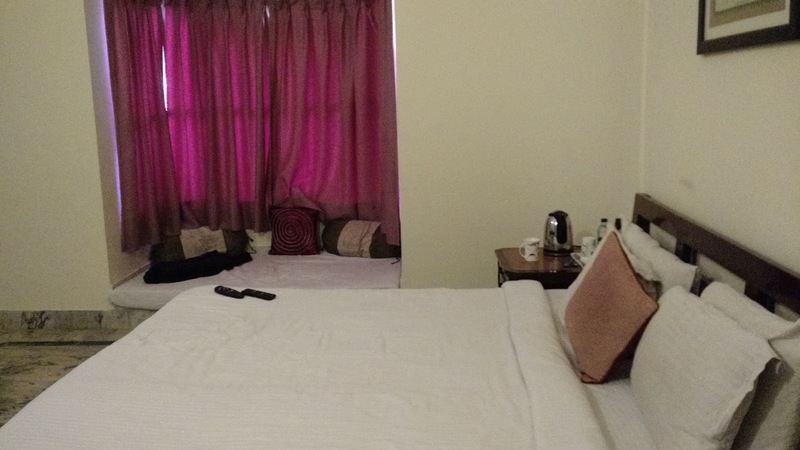 The types of rooms available are classic, cottage and luxury tent, the latter being the smallest and most expensive. We chose cottage and that was a maharaja suite in itself! Equipped with modern furnishings, TV, refrigerator, AC and electric kettle with beverage items, the most beautiful corner of the room was the seating arrangement near the window. This corner added to the charm of the room. I could imagine relaxing with a cup of tea and a book by the window side. I could not ask for more. Each cottage has a balcony seating and lawn seating outside. Looks perfect to soak up some sun on holiday. Lalita helped taking few pictures for us. Soon after unpacking, we headed to the dining hall Machan for lunch. Since only one time meal is inclusive of the package, we paid Rs 1000 per person extra to upgrade with dinner and breakfast. Restaurants or eating joints are not found around the sanctuary. Its good to secure food option within the resort. The multi cuisine dining hall has a pleasant ambiance. When sun shines through the window and soft breeze caresses you, it feels at the top of the world. 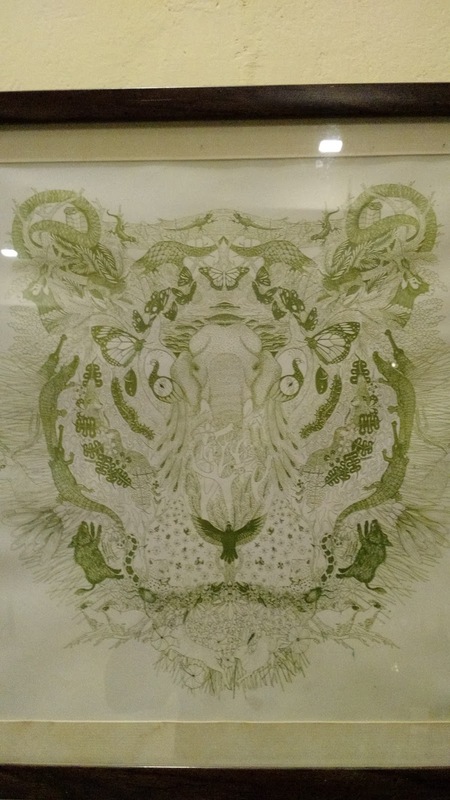 The framed pictures on walls of tigers taken in the sanctuary immediately get your attention. Among them is this picture that signifies the true meaning of the king of the jungle. The jungle defines the king. The large aromatic spread of fresh hot dishes doubled our hunger pangs. Each dish was well made and extremely hygienic. The staff is friendly and always on toes to help with refills or seating for kids. An excellent buffet lunch we had! We explored the premises post lunch. The swimming pools is unique, made in the shape of a tiger paw. We resisted the temptation to take a dip in the cold month of January. Close to the tents, there is an activity area for indoor games. That's where we met Gopal, the admin staff who showed us around. 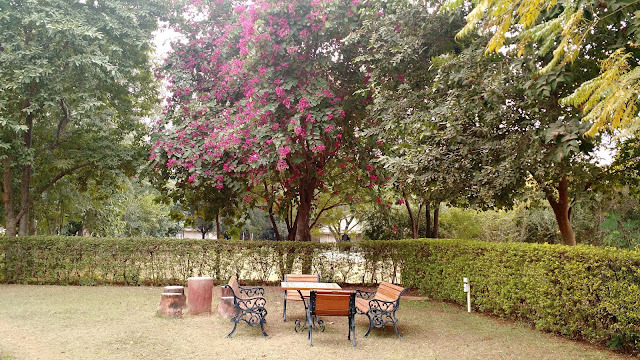 The resort is dotted with trees, plants and blooming flowers. 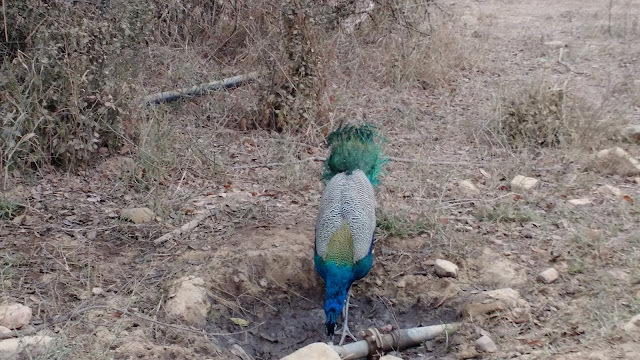 It is a treat to see peacocks dance to the rooftops and gentle stray dogs playing within the premises. Gopal took us behind the resort for a walk around a pond and a pathway between a village & hills. 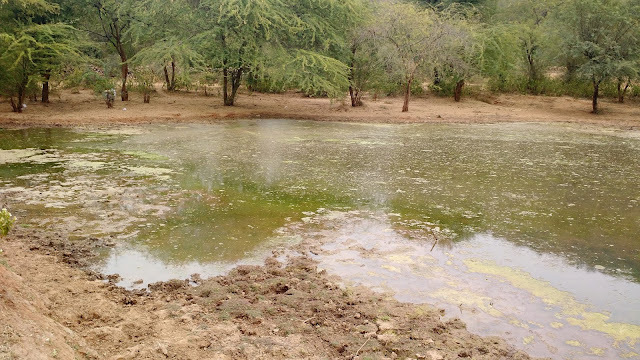 Leopards often come to drink water from this pond- The statement from Gopal scared us but we still took the risk. 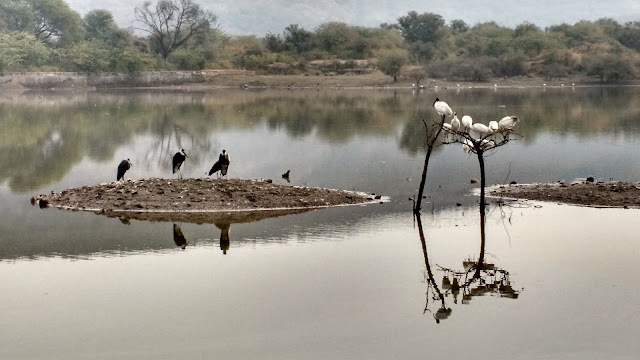 For all nature lovers, this is the place for bird watching. While we did that, I heard bubbles from the pond. My heart skipped a beat! Was it a leopard?? 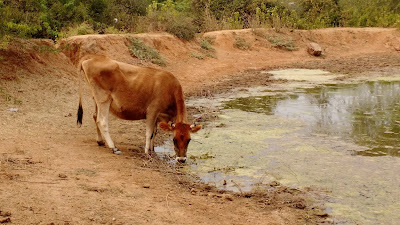 I turned around to see a cow drinking water from the pond. Thanking our stars, we quickly followed Gopal for the sight seeing near the village where peacocks welcomed us. Lush green farms and calmness of the place are rare commodities in cities. Enjoy every minute here. Wear sports shoes for the walk, as it's a rocky place. As the sky started to get dusky, we raced back to the resort for hi tea, served right next to the dining hall. Ginger tea coupled with hot pakodas...felt too good to be true. And there were cookies too! 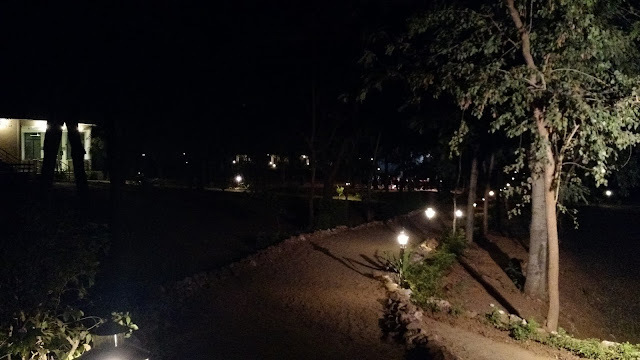 The resort twinkled with dim lights and the whole place came alive as a fairy land. Respecting the law of the jungle, lights in Sariska Tiger heaven have been kept dim, so as not to disturb the nature around. I wish everybody was as thoughtful as them. Dinner was served at 8 and here again a large variety brought smile to our faces. 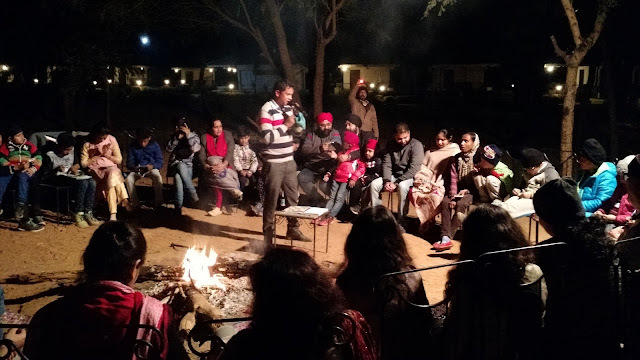 We bumped into the resort manager Mr. Pandey during post dinner walk. 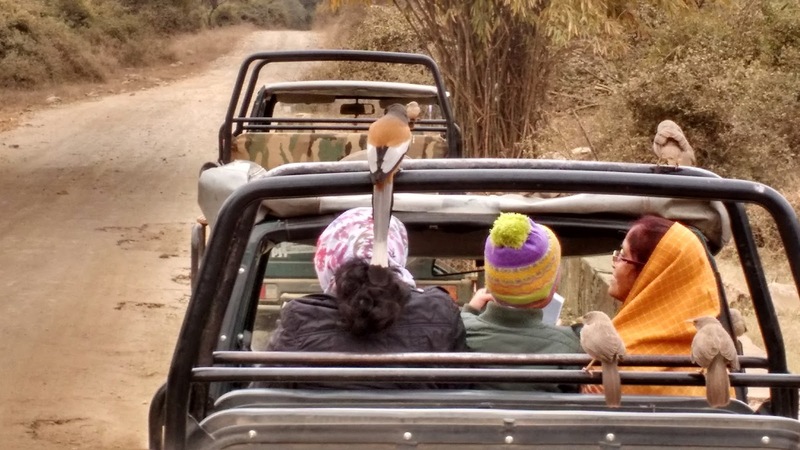 He chatted with us for a long time giving minute details of Sariska Tiger Heaven and the flora fauna around. The topic of conversation changed from city pollution and global warming to basic etiquette and rules of the jungle. 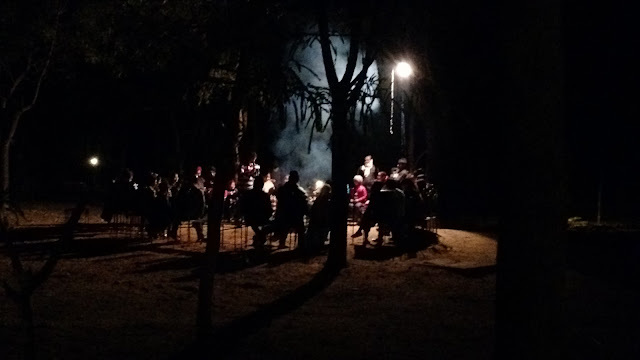 Since Tiger Heaven strictly adheres to the rule of the forest, all lights are kept dim, be it indoor or outdoor, no loud music is allowed and no DJ's beyond 9 pm. Plastic is discouraged and hygiene is well maintained. We did not realize it was late and we chatted for thirty minutes. It is less frequent to find people who share the same wavelength. It was lovely meeting him. 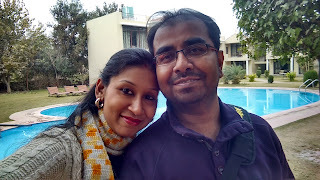 Early morning we left for safari and returned to the resort for a scrumptious breakfast, comprising eggs, bread butter, cornflakes, stuffed paraatha, vermicelli, fruit, tea and juice. The three hours safari had left us hungry and we gobbled everything quick. Could not thank the staff enough for their hospitality. The morning sun shined beautifully and the resort looked even more gorgeous. Soon it was time to pack up and leave. 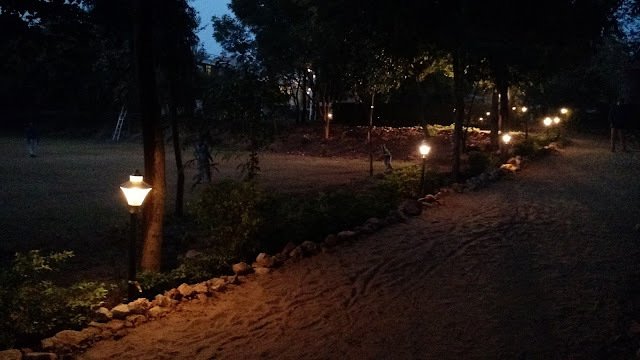 Reluctantly we bid goodbye to Sariska Tiger Heaven with a bagful of beautiful memories and a hope of returning soon. Sariska does not have any public transport, rail or flight connectivity. 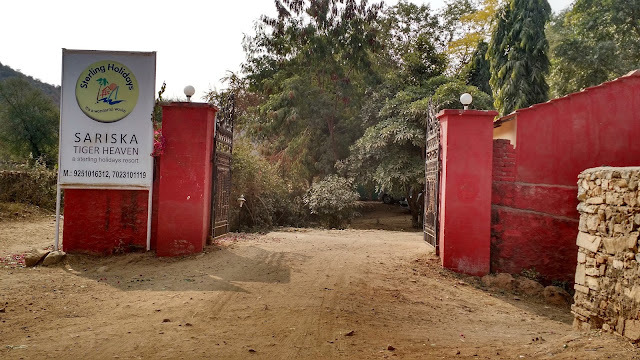 Located approximately 171 kilometers from Gurgaon and around 120 kilometers from Jaipur, you can either hire a private taxi or drive yourself to Sariska via NH24. 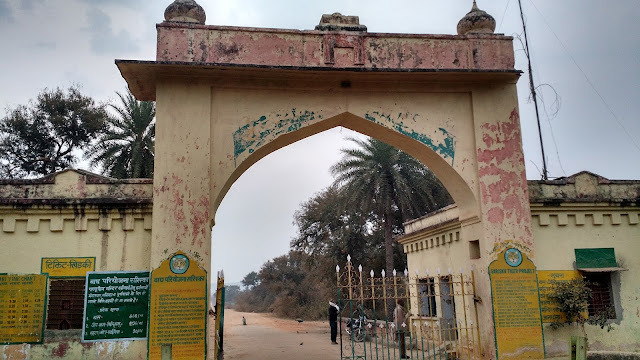 Gurgaon - Manesar- Neemrana- Bheror- Kotputli- Viratnagar- Sariska. We left from Gurgaon at 7:00 am. Surprisingly trucks plying during that time caused slow moving traffic on highway after crossing Manesar. 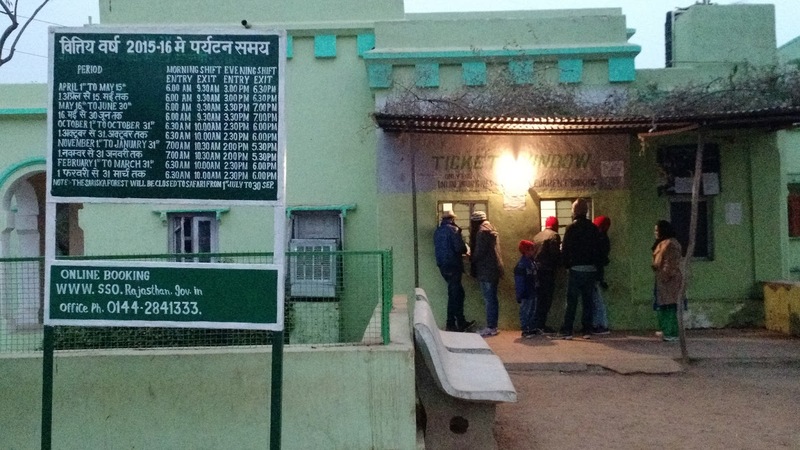 Continue driving till you see a signboard reading Alwar 81km and 69 km straight towards Jaipur. As soon as you bend left, your nightmare begins. Drive carefully and if possible slowly here. 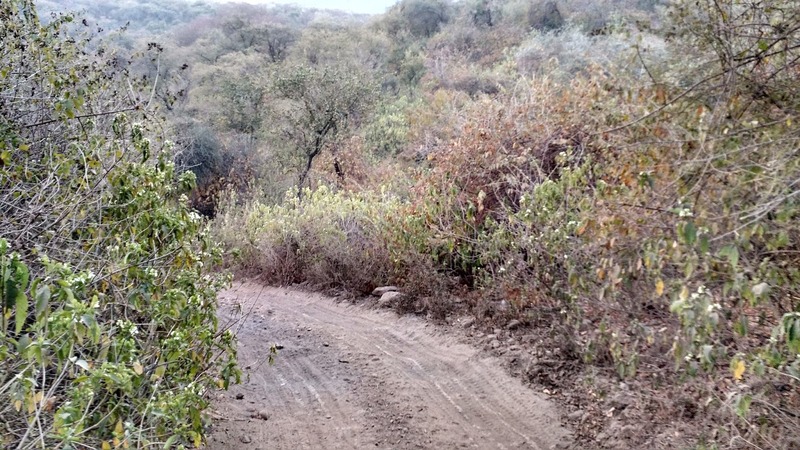 Be ready for packs of monkeys, potholed roads and under-constructed sights for at least 15 kilometers till you pass the Aravali mountains and curvy roads that mark the beginning of Sariska. 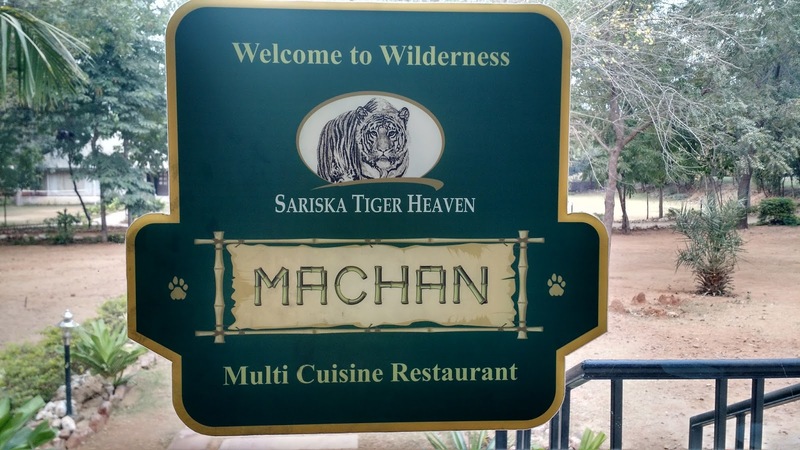 An easy to miss spot on the way points right for Sariska Tiger Heaven and left for Tiger's Den. The 800 meters approach-road towards Tiger Heaven resort is another big hurdle. Brace yourself while you do that. Sariska is one of the closest vacation places from Delhi. 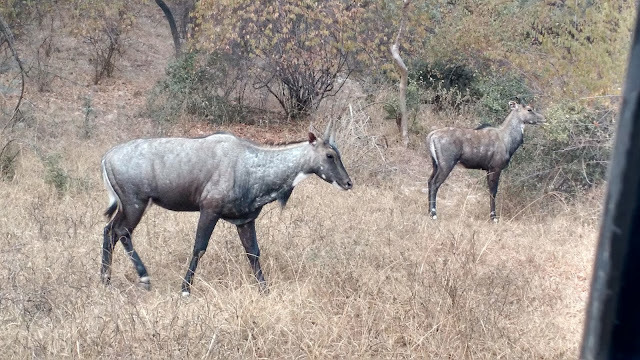 Known for its Tiger Sanctuary and the adventurous jungle safari, a four hours drive from Delhi takes you to the enthralling forest of Sariska. Experts advice that the best time for jungle safari is morning, which has high probability of sighting a tiger. 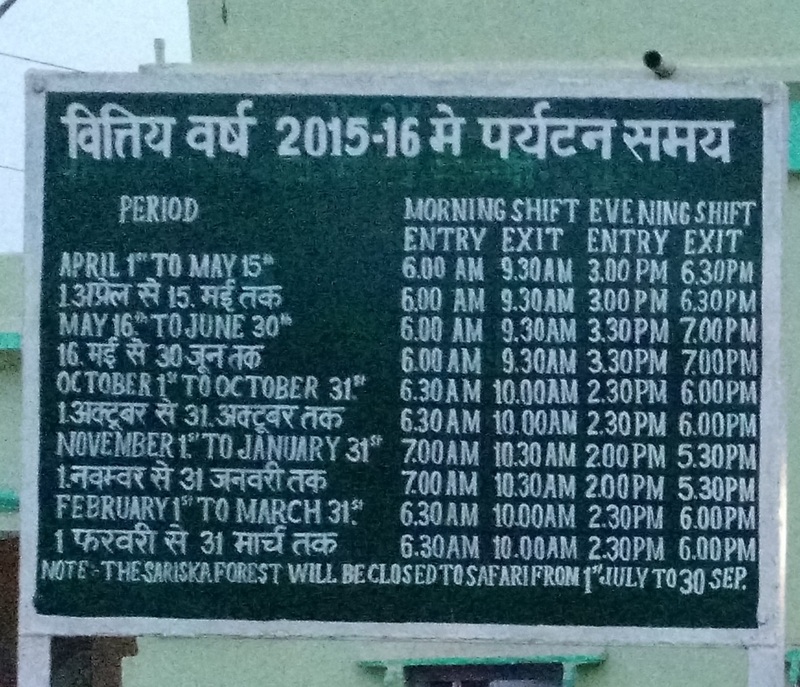 However, nobody can guarantee spotting a tiger in Sariska any time, because the forest is their home, not ours! We left from the resort before sunrise to reach the safari ticket window as early as possible. 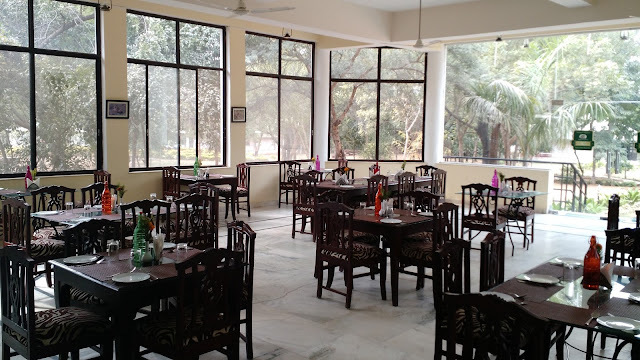 It was indeed surprising to see the place bustling with enthusiastic guests on a chilled winter morning. However these are not the updated rates on the board. We hired a full gypsy for ourselves and paid Rs 580 at the window. Rs 2880 was to be paid to the guide. (Payment to the guide is made separately after the safari ends). Though the rules are simple, no body really cares. How difficult is it to respect the jungle rules? 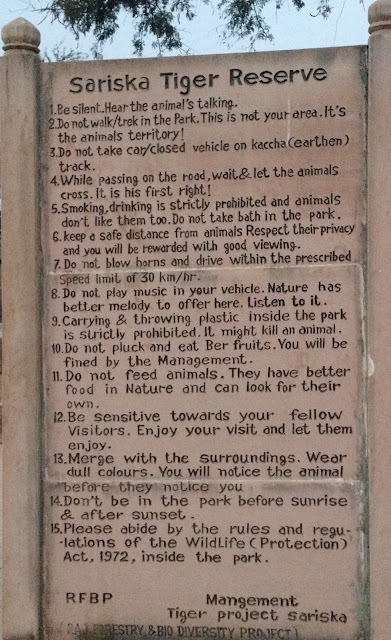 The top most ones are are- Be silent (which people find very difficult), do not wear loud or bright colored clothes, smoking drinking prohibited, do not litter plastic waste, do not feed animals and NEVER get off your jeep/canter. Our guide Seetaram, toured us through the forest while providing valuable info about the forest. Spread over an area of 866 square kilometers, Sariska is home to large variety of birds and animals species, the most common ones being spotted deer, swamp deer (barah singha), neel gaai (blue bull), peacock, jackal (siyaar). 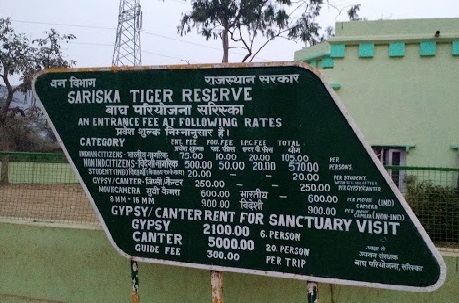 Seetaram said there are 14 tigers in Sariska sanctuary and most of them are radio collared. Among them, ST6 is the biggest and oldest male tiger while ST7 is the largest and most photographed tigress. Only 20% of the forest is open for safari and divided into three zones. Zone 1 has the highest probability of tiger sighting, though its a matter of sheer luck. Be it the sandy trails, bumpy roads or dense trees, each element leaves you feeling excited. 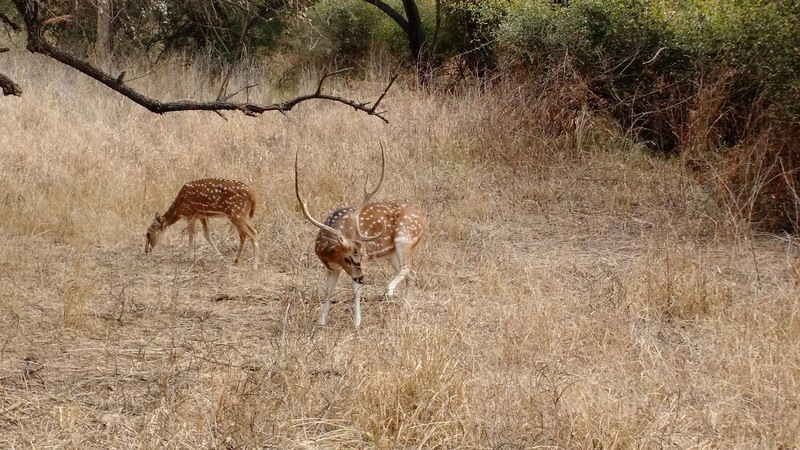 Our driver took us to a spot where a leopard had killed and dragged a deer to a tree. This tree had stirred up lot of excitement among all visitors. For a moment I felt sorry for the deer, but that is the law of nature. Visitors are NOT allowed to get off their jeep/canter anywhere. The only place where it is allowed is at the rest stop where the drivers take a break. 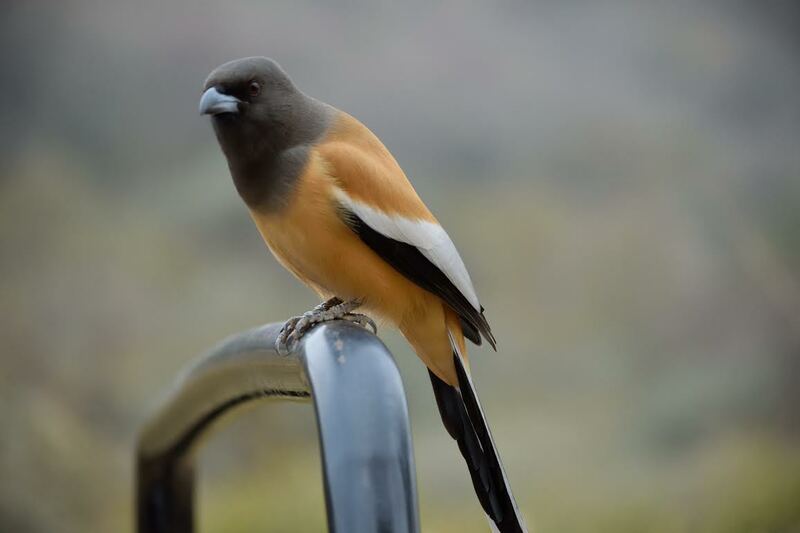 Blabber birds and the beautiful orange Rufous Treepies flock to all jeeps here as if asking for food. A visit to Kankwara lake is also a part of the safari. This lake is a dwelling place for crocs as well as large number of birds. January is a good time to watch the migratory birds bask in the Sun. We moved out after a stoppage of fifteen minutes. As I mentioned, spotting a tiger is quite difficult, we still had our senses alert, hoping to catch glimpse of our national animal. We spotted all animals but a tiger. 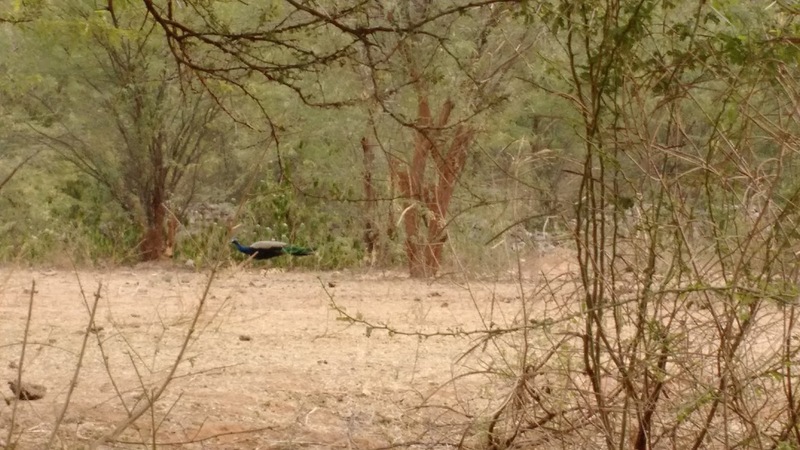 Spotted deer, neel gaai and peacocks shying away is a very common sight. Suddenly, all gypsies and canters were made to halt at a place where the guides told that two mating tigers were heard roaring from a distance. Obviously, all the hype melted in few minutes when nothing was heard by visitors. Our driver showed us a tiger paw mark on the way, claiming to be a mark from night. Well, who knows what the actual story is? After-all, one is interested to see a tiger, and not the latter. 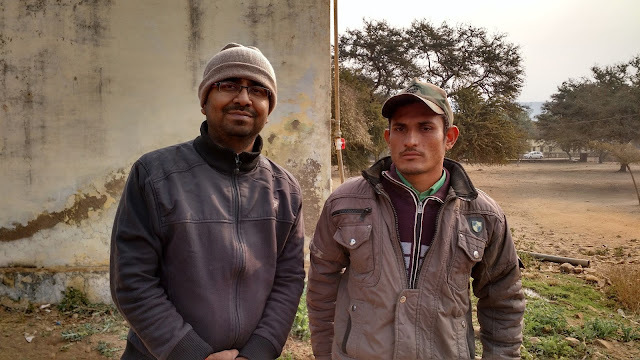 As the day progressed, our hopes of seeing a tiger was fading, when Seetaram met a fellow guide of another gypsy who informed about the presence of a female leopard near a pond. Without wasting a single minute. we rushed to the spot. The beautiful leopard looked straight into the camera while we clicked her. Surprise, surprise..she was with her two cubs. Sensing threat, the leopard left the place soon, hence upsetting those who missed that lovely sight! The disappointment of not seeing a tiger was overpowered by the joy of seeing a leopard, which is a rare sighting indeed. The three hours safari ride came to an end and Seetaram happily posed for the camera. Whether or not you spot a tiger, the safari itself is a thrilling experience. It is a must visit for wildlife photographers and nature enthusiasts.